On February 9, 10 and 11, 2019, use the moon to find the red planet Mars, which still shines as brightly as a 1st-magnitude star, or one of the brightest stars in our sky. Then let Mars help you find a much fainter planet, distant Uranus. 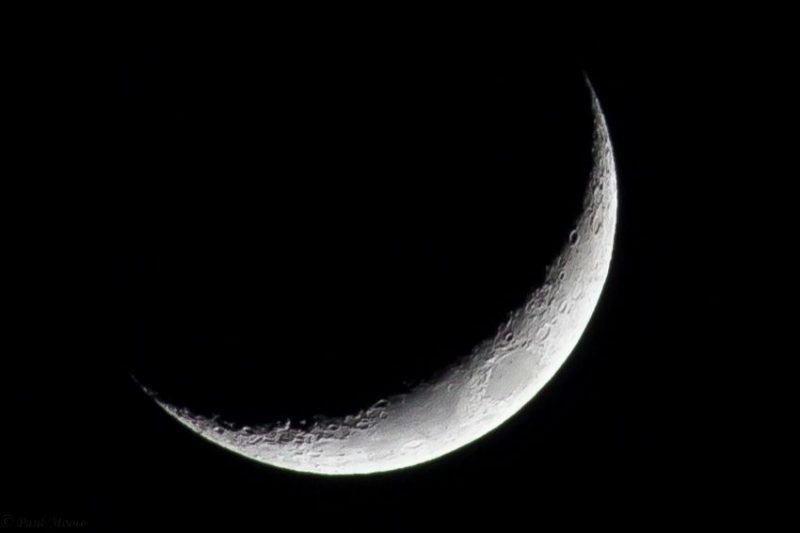 You’ll have no trouble seeing Mars, even in the glare of the waxing crescent moon. But – although it’s theoretically visible to the eye under ideal conditions – you’ll be unlikely to spot the planet Uranus with the eye alone; use your binoculars for this one, or a small telescope. Mars and Uranus are now quite close together on our sky’s dome. If you have binoculars, aim them at Mars to glimpse Uranus in the same binocular field. Just don’t mistake the star Omicron Piscium for Uranus. This star is brighter than Uranus. It makes a nice triangle with Mars and Uranus in a single binocular field. 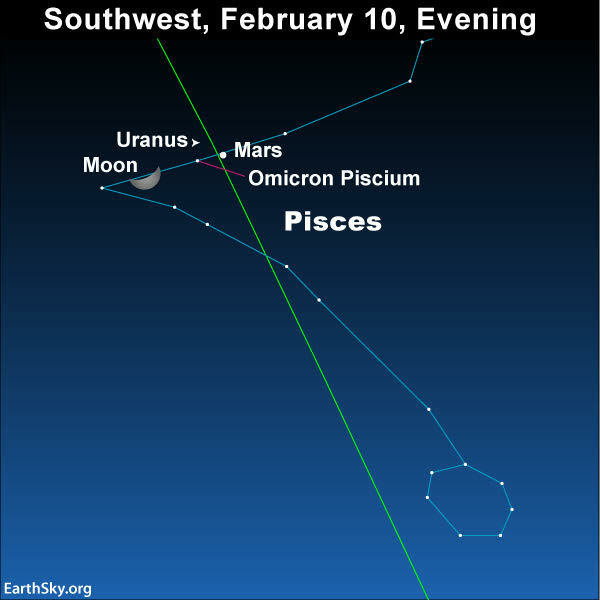 As seen from North America at nightfall February 10, the moon pretty much makes a straight line with the star Omicron Piscium and Mars, with Omicron Piscium in between the moon and Mars. Once you find the star Omicron Piscium, move this star to the edge of your binocular field, so as to reduce the lunar glare. To help you with your efforts, this sky chart – via SkyandTelescope.com, – shows Uranus’ position relative the the star Omicron Piscium (simply labeled O in the sky chart). Mars remains in the close vicinity of Uranus this upcoming week, giving you a golden opportunity to use Mars to zoom in on Uranus with binoculars. As seen from North America at nightfall February 10, the moon makes a line (nearly) with the star Omicron Piscium and Mars, with Omicron Piscium between the moon and Mars. As viewed from the world’s Eastern Hemisphere on February 10, the moon will be not quite in line with Omicron Piscium and the moon. But no matter. From around the world, the star Omicron Piscium is still on the “moon side” of Mars. By the way, Mars is now moving eastward in front of the constellations of the zodiac at better than 1/2 degree per day. 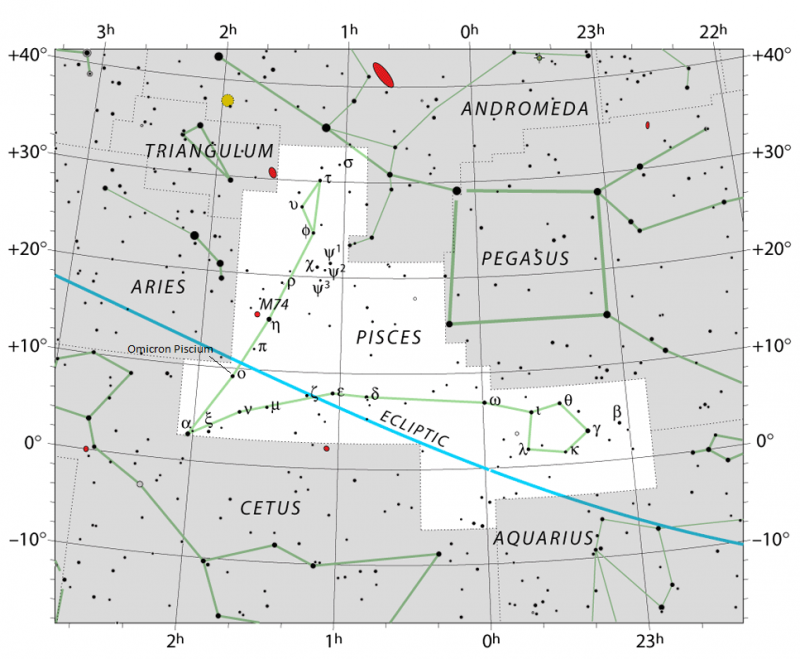 Sky chart of the constellation Pisces via the IAU. We list the star Omicron Piscium. Click here for a sky chart. 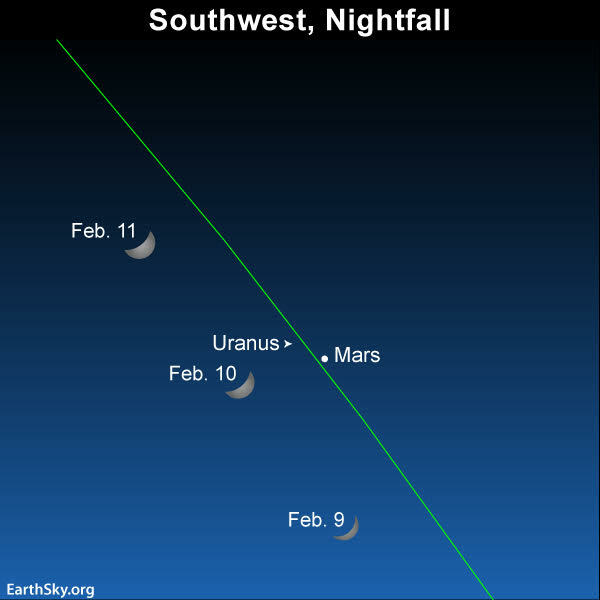 The moon will have left Mars and Uranus’ part of the starry sky by February 12. However, Mars is heading in the direction of Uranus at over 1/2 degree (one moon diameter) per day. For a convenient reference, the moon’s angular diameter measures about 1/2 degree on the sky’s dome. Depending on where you live worldwide, Mars will swing closest to Uranus on the evening of February 12 or 13. This Mars-Uranus conjunction will find Mars passing one degree (two moon diameters) north of Uranus. A day or so later – on or around February 14 – look for Mars to line up with Uranus and the star Omicron Piscium, with faint Uranus appearing midway between Mars and Omicron. Bottom line: As darkness falls on February 9, 10 and 11, 2019, use the lunar crescent to find the bright planet Mars, and then let bright Mars guide you to the faint planet Uranus.